The majority of wounds should be handled by putting pressure directly on the wound using sterile gauze. Gauze pads hold the blood on the wound and help the components of the blood to stick together, promoting clotting. If you don't have gauze, terrycloth towels work almost as well. If the gauze soaks through with blood, add another layer. Never remove the initial bandage since peeling blood soaked gauze off a wound removes vital clotting agents and encourages bleeding to resume. Blood needs to clot in order to start the healing process and stop the bleeding. Step two to control bleeding is to elevate the wound above the heart. By elevating the wound, you slow the flow of blood. As the blood slows, it becomes easier to stop it with direct pressure. Remember, it must be above the heart and you must keep direct pressure on it. The acronym PAIL identifies the four major types of wounds: puncture, abrasion, incision and laceration. Puncture wounds caused by a pointed implement such as a nail, cleat or pin may be deep and are difficult, if not impossible, to clean. Puncture wounds have the greatest chance of tetanus due to bacteria being left in the wound as the implement is withdrawn. Determine the implement, date of last tetanus shot and depth of penetration. Abrasions are superficial in depth and may cover large areas. Due to the large amount of skin surface, they have a high chance of infection. First aiders should rinse the surface with a wound wash, pat dry with sterile gauze, apply antibiotic ointment and cover. Moist wounds have been shown to heal faster than the old days of “letting it air out to dry”. So, first aid cream and a bandage are the order of the day. Incision wounds are made with sharp, straight instruments such as scalpels, metal buckle edges and knives. The wound has straight edges and may be long-short or wide-narrow. The wound should be washed with water or sterile wound wash and wiped in the direction of the incision to ensure proper removal of any debris. Depending upon length and depth, stitches may be necessary. 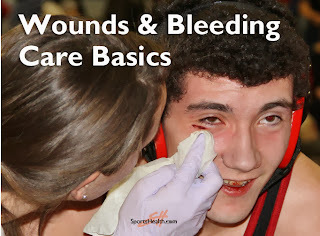 Laceration wounds have rough, uneven edges and involve the greatest amount of tissue damage. The wound should be thoroughly irrigated and wiped lengthwise to avoid lodging any debris under the multiple edges of the wound. Stitches may be required and may involve both internal and external sutures depending upon depth and size. As is the case when dealing with any body fluids, the use of universal precautions is prudent. Gloves, sterile bandages, dressing to hold the bandage in place, wound wash/water and referral to additional care when needed are typical wound care steps.